Yana Sverdlova was great! She was very warm and friendly with my daughter. It was my daughter's first dental visit andshe made the experience extremely comfortable. The staff is also very friendly. I would definitely recommend! Yana Sverdlova was great! She was very warm and friendly with my daughter. It was my daughter's first dental visit and she made the experience extremely comfortable. The staff is alsovery friendly. I would definitely recommend! She explained everything before she did it, she was patient and gentle with my children, including one who was a moreanxious patient. I really appreciated that she genuinely gave us the choice about what to do and what not to do (which I have not found to be the case with other pediatric dentists in NYC, who have been much more aggressive in selling services). Her office was pleasant and child friendly without being like a toy store and I felt like it her care was more focussed on the outcomes for the kids. She explained everything before she did it, she was patient and gentle with my children, including one who was a more anxious patient. I really appreciated that she genuinely gave usthe choice about what to do and what not to do (which I have not found to be the case with other pediatric dentists in NYC, who have been much more aggressive in selling services). Her office was pleasant and child friendly without being like a toy store and I felt like it her care was more focussed on the outcomes for the kids. Dr. Yana Sverdlova is a board certified pediatric dentist with expertise in the unique needs of children and adolescents. She only sees patients up to age 26. She knows that young patients require a special approach and a gentle touch. She is certain that establishing a “dental home” before age one is important for achieving excellent lifelong dental health. 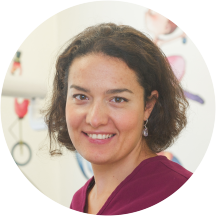 Dr. Yana believes that in order to build a confidence and trusting relationship with kids it takes time, patients and commitment. After graduating from the University of Medicine and Dentistry of New Jersey (UMDNJ) School of Dentistry, Dr. Yana completed General Practice Residency program at Robert Wood Johnson University Hospital in New Brunswick, NJ. After working as an adult dentist for over a year Dr. Yana discovered joy in treating kids and then underwent two year sub-specialty training in Pediatric Dentistry at Mount Sinai Hospital in Manhattan, NY. Dr. Yana has had an extensive training in all phases of pediatric dentistry including advanced preventive and minimally invasive dentistry, nitrous oxide sedation and general anesthesia, special needs dentistry and interceptive orthodontics. Dr. Yana is a clinical instructor and attending pediatric dentist at Mount Sinai Hospital in Manhattan, where she performs pediatric dentistry in operating room for patient’s comfort and relaxation. She is a member of the American Academy of Pediatric Dentistry and the American Orthodontic Society. When not creating little smiles, Dr. Yana’s life revolves around her husband and a young daughter. She loves skiing, enjoys biking and swimming. She was helpful and pleasant. And so was her assistant and front desk person. Dr. Sverdlova is a competent dentist, but not at all warm and fuzzy with kids.